Written over the course of two years, The Diary of a Young Girl (also known simply as Anne Frank’s Diary) documents the daily life of then-13-year-old Frank and her family while in hiding in a sealed-off room above her father’s office building during the Nazi occupation of the Netherlands. The book has been translated into dozens of languages, and even appears on many secondary school syllabuses as a set text. At the end of February this year, a total of 305 copies of the Japanese version of the book were found to have been defaced – some seemingly slashed with a knife, others with entire pages messily torn out – across libraries in Tokyo, the Asahi Shimbun reports. The affected libraries have not reported any other acts of vandalism or theft, leading authorities to believe this to be the handiwork of a person or persons with a serious motive and message to send. Defaced copies of the book have so far been discovered in libraries in Tokyo’s Nakano, Suginami, Nerima and Shinjuku wards, and it was reported that a library in Tachikawa, West Tokyo has removed its copies of the text from shelves, asking patrons to ask for it in person should they wish to borrow it. Police are currently investigating surveillance footage taken within the libraries in an effort to pinpoint those responsible, but some Japanese have already begun to suspect extreme-right groups within the country, who have become increasingly vocal since right-wing politician Shinzo Abe was elected as prime minister for a second time. Numerous groups within Japan, however, have taken steps to assure the global Jewish community that acts of vandalism such as these do not reflect the feeling of the nation as a whole. Naturally, amongst this confusion and anger internet speculators have also chimed in on the subject, with some proposing that the recent defacement of copies of Anne Frank’s Diary in Tokyo may have been carried out by Koreans living in Japan in an effort to create an anti-Japanese sentiment in countries other than their own. Recent footage of anti-Japanese protests in Seoul showed men and women holding placards that displayed images of both Mr. Abe and Anne Frank, the former whose face many protestors were seen to stamp on in front of cameras. For now, though, the true culprit or culprits are unknown. 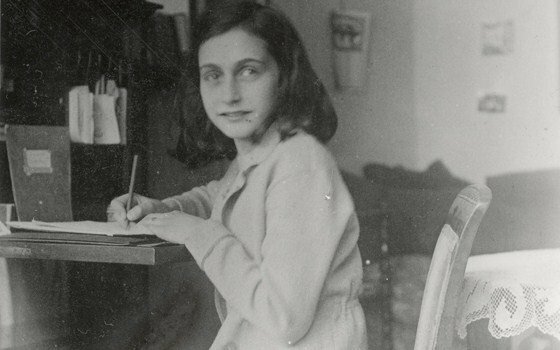 Thankfully, a donation of 100 replacement copies of The Diary of Anne Frank have already been made – though the donor chose to do so anonymously – and libraries whose copies have been defaced have vowed to replace them as soon as possible. We’ll have more on this frankly bizarre story as soon as it becomes clear. We don’t care about the calories, just give us our Gundam donuts!